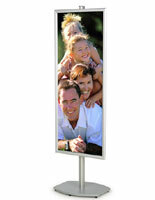 Snap Frames : This snap-open fixture is one of our best-selling poster frames! BRAVA Sign Display Stand: 22" x 28"
Show off your services and products in your hotel or bank lobby with this unique BRAVA sign display stand! 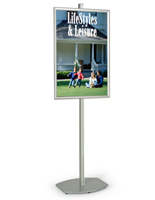 Standing 6ft tall, the sign stand displays your 22" x 28"poster in an aluminum snap frame. The, sign display stand is especially convenient because it doesn't require you to mount it to a wall or hang it from a ceiling. In fact, all you need is a small amount of floor space to display your advertising signs in these lobby displays! Sign frames like the snap frames are ideal because they allow for fast poster changes. Unlike many poster frames, these snap sign frames do not have to be removed from the sign stands in order to change the posters inside. 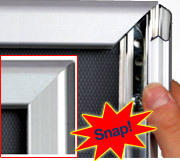 Simply snap open the metal edges, place in your sign, and snap shut. We even provide a lexan overlay to protect and preserve your signs! 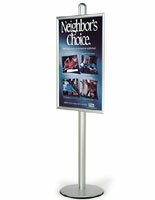 Sign displays, sign stands, and other lobby displays are simple, yet effective advertising media. They are easy-to-use for you and eye-catching for your customers. With its dramatic height, this 6ft BRAVA sign display can hardly go unnoticed! 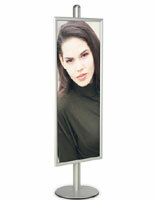 The BRAVA sign display stand is a heavy duty unit on which to show off your products and services. It is fabricated from a sophisticated brushed aluminum pole and solid base. Out of all our sign displays this is the strongest, most stable one. 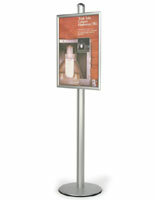 The sign display stand is also one of the classiest poster stands that complement an upscale environment. To attach the snap frame to the sign display stand, slide the connectors down the groove in the pole. Adjust to the appropriate height and tighten!